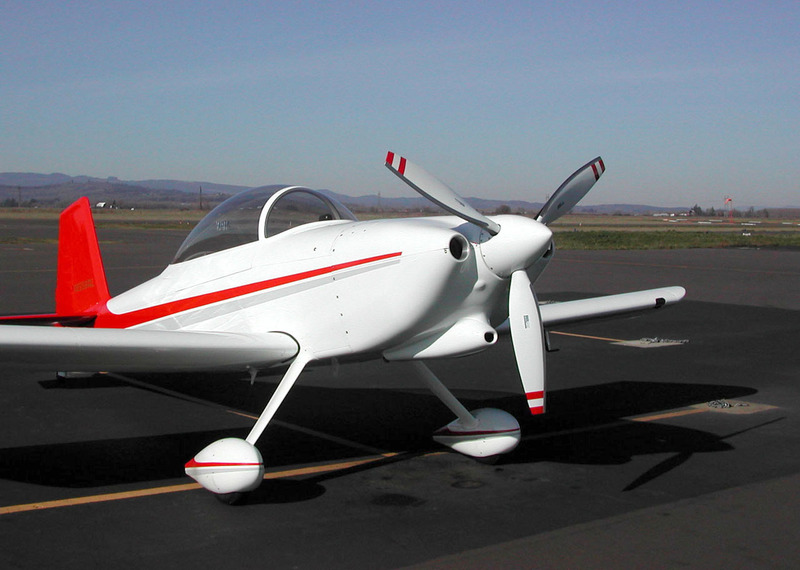 When planning my RV-8 I knew right from the start that I wanted a constant speed prop. Any aircraft with the speed envelope of an RV (50-230 mph) would be operating under a considerable compromise with a fixed pitch prop. Therefore I planned on installing the Hartzell compact hub constant speed prop that Van's offers it's builders right from the outset. My Hartzell has performed admirably and I really have no complaint with it, but... if you have an experimental aircraft that you've built yourself you know about that little voice in your head that keeps talking to you. "Gee, if I just made this change I could (substitute any of the following here: make it go faster, make it more efficient, make it more functional, make it look better, etc. ad nauseum)". That little voice has been talking to me about propellers. My engine/prop combination is probably the single most common RV power train there is, and I'm sure there will be many builders interested in what can be achieved with a prop switch, hence this section of the site. My interest in upgrading my prop began by reading an article in the December 2000 issue of Custom Planes Magazine by Larry Olson titled "Constant-Speed Pitch Distribution". 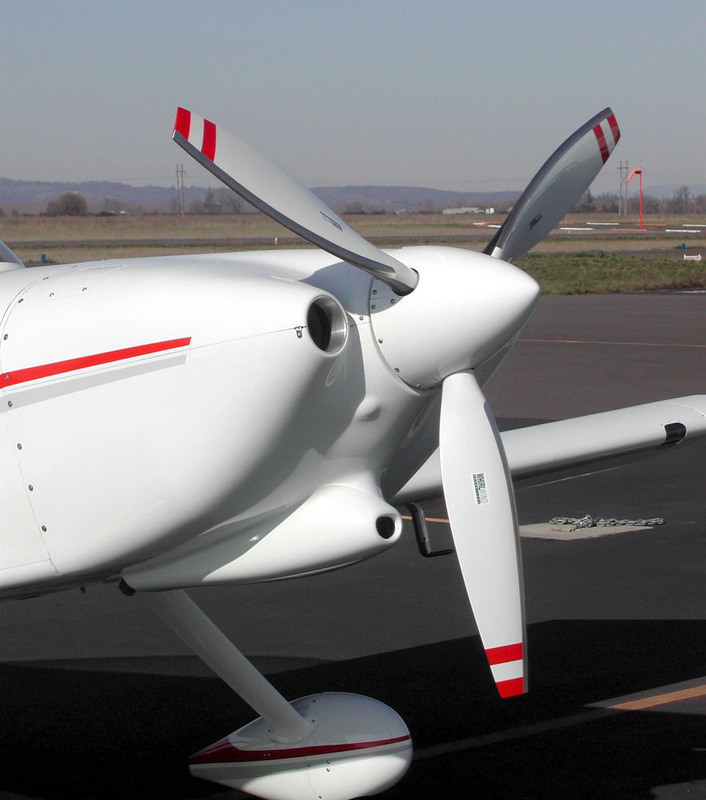 In this very interesting article Mr. Olson explains that even though a constant speed propeller changes its pitch to suit the condition, there is more that must be considered in assessing efficiency. Although the whole blade does indeed change pitch, the twist of the prop at any point on it's blade can only be optimized for one airspeed and rpm. Therefore inefficiencies are introduced under any other condition. To be sure, a constant speed prop is a quantum leap in efficiency over a fixed pitch model, but this twist profile (aka pitch distribution) concept made sense and got me curious. After a bit more reading I learned that the Hartzell HC-C2YK-1BF that Van's sells for the O-360 family, and that I have on my plane, is optimized for airframe speeds slower that the typical RV cruises at and therefore the whole blade is not providing optimum thrust at all stations under that condition. Hmm. The Hartzell propeller Model HC-C2YK-1BF/F7666A-2 has been vibrationally approved per FAR23.907 on the standard production Lycoming Engine Model O-360-A1A, and similar models, rated at 180 H at 2700 RPM with a restriction to avoid continuous operation between 2000 and 2250 RPM. The propeller vibration characteristics and stress amplitudes on a reciprocating engine installation are primarily mechanically generated by the engine. Any modification to the standard engine configuration to include high compression pistons, electronic ignition, FADEC, tuned induction and exhaust, and turbocharging or turbonormalizing have the potential to adversely effect the propeller vibration characteristics and stress amplitudes. Hartzell Propeller, therefore, does not endorse any such engine modification unless the specific engine and propeller configurations have been tested and found to be acceptable vibrationwise. 2. An additional restriction to limit operations above 2600 RPM to takeoff. As soon as practical after takeoff the RPM should be reduced to 2600 or below. 3. The propeller blades are life limited (with electronic ignition or higher compression) to 20,000 hours of operation. Increase of at least 5-10 mph at 75% cruise or above. Increase of ~200 fpm climb at 130 mph below 8,000 ft. Reduction of noise and perception of "smoother operation". Eliminate vibration concerns - Since composite materials tend to absorb vibration by their nature then virtually any composite prop should eliminate the resonance issue experienced with the Hartzell. While I don't have much need to spend time in the 2,000-2,250 range, I am more concerned about the newer advice against high power high prop rpm operation. The simple fact of the matter is that our engines put out more horsepower at 2,700 and when you want to get to your 10,500 cruise altitude at gross weight you want to keep it spinning to get there as quickly as possible. I don't want to have to pull the prop speed back, and thus the power produced, for fear of shortening my prop's life. Lower weight - Every RV builder wants the lightest plane possible to enhance it's flying qualities and maximize its carrying capacity. Most of the composite prop options would allow me to lower the empty weight of my plane by 10-30 lbs. This reduction would also shift the CG aft a bit which in my case would be just fine, I'm still forward of the aft CG limit with a 240 lb. pax and 40 lbs. of baggage in the aft baggage compartment. RV-8s are nose heavy when flown solo to the point that many examples cannot be trimmed to approach speed when solo. A lighter prop would go a long way toward providing better balance here. Now that I'd established my objectives the search began. With these objectives the first decision I could make was to go with a composite prop instead of an aluminum alternative. After all, the vibration and resonance issues raised by Hartzell are largely due to the natural properties of aluminum which can resonate somewhat like a tuning fork. Any composite prop would be inherently more damp and therefore less susceptible to sympathetic resonances. Initial research into the composite prop options indicated that at this time (fall 2002) there were four alternatives. They are from MT Propeller, Aero Composites, and Whirl Wind Propellers. Below is an overview of the three options. For comparison, the Hartzell is 55 lbs plus the Van's spinner assembly which adds another 4 lbs. Therefore all three options would be lighter than the Hartzell's system weight of 59 lbs. Since then Whirl Wind has developed another significant option, a prop designed specifically for RVs, the model 200RV. Click here to see a comparison table. The first decision was to go with a two or three blade design. In doing my research I learned that there are inherent advantages and disadvantages to each. As part of my investigative process I exchanged e-mails and had phone conversations with each manufacturer. While at AirVenture 2002 I visited with the Aero Composites and MT Propeller folks at their booths, Whirl Wind did not display. I was initially attracted to a 2-blade design for the simple intuitive reason that there is less blade area and therefore less drag. We have all heard that 3-blade props improve climb, it's a popular retrofit for Cessnas and Bonanzas, but since I was more interested in improved cruise speeds and not necessarily improved climb (RVs climb pretty darned well already! ), this became my initial direction. As I learned more and more from various sources however it turns out there's a very small difference in efficiency with the 3rd blade, something on the order of .5% loss due to the increased area. There are also offsetting factors in favor of a 3-blade design. When I distill down what I've gleaned I get the following summary. Frequency of noise shifted up (at 2,700 rpm 2-blade = 5,400 passes, 3-blade 8,100 passes): less perceived noise in cockpit. Admittedly this is a fairly simplistic lay summary of some fairly sophisticated engineering and aerodynamic principals, nevertheless this is how it sorts out from my point of view. Deciding on a prop however is not as simple as just looking at the features and benefits, there are a lot of other important considerations such as the reputation and support of the manufacturer, weight, and cost. Every manufacturer uses different techniques which can alter the fundamental balance of characteristics. For example you can see from the table that the Whirl Wind 150 is the lightest prop of the group yet it is also a 3-blade design. The Hartzell is a 2-blade with less drag than a 3-blade, yet it will likely not be the fastest on an RV because of the pitch profile. So, many factors must be looked at simultaneously in selecting the right option for your application. Assessing the manufacturer is an important consideration as well. As important as a prop is, I want the manufacturer to be credible and to be there down the road should my prop need service or parts. From this standpoint clearly MT comes out on top with a long history of high-performance props and certified designs. Clearly their track record is best, they have the most complete testing (required for certification), and an established network of service centers. Whirl Wind and Aero Composites are newer companies but with significant technical expertise in each case. I believe Whirl Wind has been around a few years longer and does have more props in the field. I was impressed with the fact that the 150 design has been in "test period" for a full two years before being released for full production just a two months ago. They sent eight props out for installation on various aircraft, including several RVs, and had the pilots return the props periodically for inspection. The 150 was put into production and offered for sale only after this period was completed. They report there were a few relatively minor changes (none to the blade or hub) made to the design as a result of the test period data. In doing my research I learned some interesting things from all the vendors, but especially from Whirl Wind: Whirl Wind blades are dynamically balanced, not just matched by blade weight. The reason for this is that the moment of any imbalance is more important than the outright amount. Once the blades are dynamically balanced the prop is assembled, then statically balanced. Builders should still have their props dynamically balanced in the traditional method, but the measures taken by Whirl Wind ensure that the prop won't contribute to any imbalance, rather it will be in the engine assembly. So, which one to choose? All three of these props have pitch profiles suitable for the RV so that's not a point of differentiation, and each manufacturer has certain characteristics that are appealing. In the end though it was the light weight, the fully finished spinner assembly, reasonable lead time, apparent quality of both the design and construction, positive reports from their beta pilots, the candor of Jim and Patti Rust (proprietors), and the overall value that caused me to pick Whirl Wind. With my initial decision made and my order in it was time to collect some baseline performance data and think about testing methodology. Testing is important because if I can't make an accurate comparison of any performance differences then I'll never know if switching props was worth it. In speaking with other builders, but especially with the prop vendors, I learned that there is a real lack of real world empirical propeller test data. Without good data how can one make an objective decision? The answer is that you can't, therefore I resolved to do the best job of testing I could, not only for myself but for others in the RV community as well. Props are an important element in the performance of our aircraft and the more we know about how these various props work with our airframes the better decisions can be made. Therefore the extra time and effort here should pay dividends for me, and also the rest of you making decisions on propellers. 12/29/02 saw a break in the weather here in the Northwest so out we went to collect the "before" data on the Hartzell. I chose to do the testing near gross weight because A) it would allow me to take a passenger to assist with data collection, and B) most performance figures are shown at gross weight in order to be conservative and show worst case. Frequent backseater Randy Griffin was drafted for the task and we planned for the test to be close to my plane's 1,800 lbs gross weight. Fuel was noted for each test and gross weight at that time computed. Contents of aircraft (people, equipment) were weighed post-flight to verify weights. In all I think this is fairly sound data. Prop Tach 3 optical tachometer, guaranteed to be accurate within 1 rpm. Radio Shack Sound Level Meter with several scales as well as A and C weighting. Tanner Racing digital race car scales guaranteed accurate to within 1 lb. As with many projects, the scope of this one has crept. Instead of simply installing and testing the Whirl Wind 150 against the Hartzell, I have entered into an agreement with Whirl Wind to expand the scope of the test to include a two-blade model as well — a non-counterweighted version of their model 200C would also be included in the test. Other new models under development could be included as well, which turned out to be the case with their new 200RV. I have a Woodward Model B210776-A prop governor as purchased from Van's. Whirl Wind recommends that Woodward or McCauley governors have their pressure relief value reset to 475 lbs due to the smaller piston in the prop hub. This is done to avoid overspeeding under high-temp conditions. Apparently under high speed and high power settings with the oil very hot it can thin out to such an extent that adequate oil pressure to move the blades to the coarse pitch needed cannot be maintained. Consequently I removed my governor when I removed the prop and sent it to Sullivan Propeller in Hayward, CA which was the shop Jim Rust recommended. In talking to Brian Sullivan I learned that the Woodward governors can be reset where the McCauley's cannot. Be so advised if you plan to make this type of swap. Hanging the prop was made quite a bit easier by the light weight. Picking up this prop compared the Hartzell is truly a shock. The spinner parts including the backing plates and fill plates behind the blade roots, are very high quality pieces. The precision of both these fiberglass parts and the the hub assembly is truly impressive. There is a front bulkhead in the spinner that engages the front flange on the hub -- this can only work with very precise manufacturing. One bit of advice for those who remove their props: I noticed quite a buildup of film in the crank center, visible with the prop removed. My guess is that it was either lead or carbon that had deposited itself on the inner walls of the hollow crank from centrifugal force during operation. My engine/prop only had 287.5 hours on it, I can only imagine what that would look like at 500 hours or more. The moral to the story is to always inspect that area, and clean as necessary, if you ever remove a prop. For background on the performance of the 200C, there was an article comparing the 200C to several other aerobatic props run in the June 2001 issue of Sport Aerobatics magazine that you might find interesting. Download it (Word doc) by right clicking here. The 200C was installed on 3/16/03. On 3/24/03 the weather broke and we were able to launch our prop testing mission. The testing went well and we feel like we have solid comparison data depicted in the tables below. The 200RV is Whirl Wind's brand new 2-blade prop, this time designed specifically for the RV series airframe, and I have been asked to test it. The new 200RV uses a McCauley 215 hub which is smaller and lighter than the 200 hub used in the 200C. It also features an all new airfoil designed specifically for the RV series airframe that they are calling Opti-Q. WW engineer/design Jim Rust consulted with two outside aerodynamicists on this model and it incorporates some new thinking in the airfoil. Note the very small chord at the tip as compared to both a Hartzell and WW's previous designs. There will be more complete info on this prop on the WW web site as they get closer to making it available, but the price has been established at $7,500 with their usual fully completed spinner. The spinner is the same shape as that on the 150 and is a splash of the Van's design. This prop is 6 lbs lighter than the 200C and 18 lbs lighter than the Hartzell. While the plane was out of service for the prop change I also changed batteries from a Concorde RG-25XC to an Odyssey PC680 resulting in another 8 lb reduction for a total of 14 lbs. I noticed this during my very first landing, much of that nose heaviness characteristic of the RV-8 when solo was reduced. Test data is in the tables below. Testing was performed for five parameters: weight, climb performance, max. cruise, top speed, and noise. Test methodology is detailed in each section. Test: weigh each propeller assembly complete with spinner using digital race car scale. Notes: this might seem an obvious test, but I wanted to verify the exact difference in weight and not rely on manufacturer's claims. Reductions are all relative to Hartzell baseline. Since weight is an important parameter I wanted to get accurate data here too. I calibrated the scales twice and also measured other known weight items and it all crosschecked accurately. Stainless steel spinner screws weigh nearly a pound (laying under the prop in the pic) so if you ever weight a prop don't forget them. See the Interpretation and Conclusion comments at the end for comments on the impact of the weight and CG change. Notes: RPM measured with optical prop tach, time measured with stopwatch, ROC then computed from time data. This is the most difficult test to fly correctly which is why I thought more runs would yield a more reliable result. In retrospect I wish I had taken more runs with both the Hartzell and the WW 150. This is the most difficult test to fly correctly, airspeed control is critical to the result and difficult to do. This is why I thought more runs would yield a more reliable result. In retrospect I wish I had taken more runs with both the Hartzell and the WW 150. Notes: RPM measured with optical prop tach. Results consistent with previous top speed measurement of 217 mph TAS taken on 65° day -- lower OAT will yield higher power. Notes: RPM measured with optical prop tach. M.P. measured with ship's gauge (Van's Aircraft), OAT measured with ship's OAT gauge (previously verified accurate). Notes: The Hartzell has always exhibited a "droning" at certain rpm. I was curious to note whether this was measurable or not -- as you can see from the data it is. Takeoff SPL with the Hartzell was measured twice at 114 db. 2400 rpm 110 db 20.0"
2500 rpm 108 db 20.0"
2600 rpm 108 db 20.0"
2300 rpm 107 db 20.0" 5 db quieter! 2400 rpm 107 db 20.0" Absence of acoustic resonance. 2500 rpm 107 db 20.0"
2600 rpm 106 db 20.0"
2300 rpm 107 db 20.0"
2500 rpm 110 db 20.0"
2600 rpm 107 db 20.0"
2300 rpm 106 db 20.0"
2400 rpm 106 db 20.0"
About A and C weighting: Since the ear is not equally sensitive to all frequencies we need to take this into account when we measure sound. This is usually done with "weighting" curves by giving less weight to the frequencies to which the ear is less sensitive. Several different weighting networks have been developed over the years. The one which has been found to best describe human hearing is the A-weighting network. 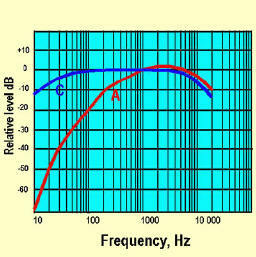 This reduces the low frequency response and some of the high frequencies as shown in the diagram. Another weighting curve, more useful in estimating the attenuated noise when personal hearing protectors are used, is the C-weighting network. Note that the C-weighted curve is a more accurate representation of actual sound pressures and hence it a better predictor of hearing damage. Personally, I would always look for a C-weighted measurement when evaluating headphones or anything related to the audio system in your aircraft since that the actual energy your hearing organs are physically subjected to. Heavy, and due to it's weight yields a very fwd biased CG in the RV-8 application. This can be mitigated partially by locating the battery in the aft baggage compartment but this is a compromise due to reduced accessibility and the longer/heavier cables required. Not well suited for non-counterweighted crank O-360s due to vibration and resonance issues, especially if electronic ignition or high-compression pistons are used. Spinner assembly from Van's must be fitted and installed. Significantly lighter, 28 lb net weight reduction. This yields virtually the ideal CG location for the RV-8. With the heavier Hartzell when flying solo I could only trim down to about 90 mph when on approach and then had to hold back pressure on the stick to get approach speeds below that. With the 150 I could trim right down to 75 mph and still have one turn left on my trim knob. My spreadsheet shows that I can still put a 240 lbs pax in back plus 40 lbs in the aft baggage compartment and not exceed the aft CG. Lastly, and this is subjective, the plane feels more responsive in trim (not that it needs to), probably due to the mass reduction up front. Significantly quieter, 2,300 rpm resonance is completely gone. I wouldn't necessarily say it is any smoother, both props are smooth, but definitely quieter. Spinner assembly comes fully finished, just needs paint. This prop needs a high pressure governor. I recommend you only use this prop with the the Jihostroj (Czech) governor. I've seen one in person and it appears to be a very nicely built item. The simple fact of the matter is that due to it's smaller hub piston the 150 needs the higher pressure to operate reliably. There is no apparent downside to operating with higher pressures. The 150 is essentially a match with the Hartzell in climb. The data suggests the 150 may be slightly better but the test weight was also 56 lbs less, therefore calling it a tie seems reasonable. In all, the 150 is an excellent choice for many builders, especially where light weight and quiet operation are priorities. The small performance differences will not be measurable or noticeable to many (most?) RV pilots. The weight reduction, and resulting improvement in CG and increase in useful load, is significant and should not be overlooked for the small speed differences. Is the 150 right prop for me given my objectives? I won't know until I test the 200C, but I sure like the way it feels on the plane! 12 lbs lighter than the Hartzell. This difference was not as noticeable as the 28 lb reduction with the WW 150, but is there nevertheless to decrease the empty weight and increase the usable load of the aircraft. When flying solo approaches I was only able to trim down to 86 mph with the 200C which is slightly better than the Hartzell at just over 90, but not as good as the 150 at 75 mph. The plane was simply better balanced with the 150. The 200C was a dead match with the Hartzell in all three speed parameters: top speed, climb, and cruise with no measurable difference. The 200C is slightly quieter, but not obviously noticeable like the 150. It's interesting that the acoustic resonance is at a higher rpm than the Hartzell, I have no explanation for it, maybe the shape of the blade? Deceleration during any mode of flight is subjectively very noticeable with the 200C. Pull the throttle back with the prop spinning fast and it'll throw you forward right now! I'm sure this braking is due to the wide blade chord and is a desirable characteristic for aerobatic maneuvers. It can also be used to good advantage in an RV to slow down in the pattern or for steep approaches. Any constant speed prop will provide good deceleration compared to a fixed pitch, but the 200C takes it to another level. Take-off acceleration seemed a bit snappier too but was not measured. I'm told that if I had checked Vx performance the 200C would likely have shown an advantage, but I did not test it, nor do I fly in that mode much because it yields such a nose high attitude and also heats up the engine fairly rapidly. Lighter weight noticeable: 18 lbs lighter than the Hartzell, 6 lbs lighter than the 200C. This definitely helps the plane feel better when solo. When doing this installation I also replaced my Concorde RG-25XC battery with an Odyssey PC680 for additional net reduction of 7 lbs. The lighter 200RV plus the loss of the battery weight now put me almost exactly where I was with the 150... the best "feel" of all. Weight is now such that when solo I can trim to proper approach speed. Subjective aspects: this prop accelerates and decelerates more like the Hartzell -- gone is the remarkable acceleration and deceleration of the 200C. The quiet and smoothness is immediately apparent. Frequent passengers in my plane noticed it right away without being prompted. This prop excels in every respect: it's lighter, quieter, and faster. I think it will end up being quite popular with RV builders for those willing to pay a premium over the Hartzell in exchange for lighter weight, better performance, and no vibration related restrictions. So what have I learned through all of this? Primarily two things: first, that it's a heck of a lot of work to do all this testing, maybe more than it's worth. Second, that the performance window (the differences between these props) is surprisingly narrow. I'm sure the aerodynamic gurus out there are snickering "I could've told you that" to themselves, but us homebuilders just have to keep pushing in our quest for optimization. I also learned that there are factors that may be more important than mere speed numbers. Weight and noise have a considerable impact on the way the plane feels, and the instantly noticeable noise difference. Even though the Whirl Wind 200RV tested the best, that doesn't mean it's the right prop for you. Rather the best prop for your plane would depend on what your own priorities reflect. The cheapest is the Hartzell, but there are issues with vibration if you have electronic ignition or high-compression pistons. (my LASAR system is a huge step forward in efficiency and I'm not willing to give it up) The lightest by a wide margin is the WW 150, which happens to benefit the RV-8 particularly CG-wise. The WW 200C aerobatic prop is as fast as the Hartzell, also lighter and slightly quieter, but more expensive. For those of you looking forward to more frequent acro this might be the best choice. It's hard to beat the 200RV as the best overall prop however. I suppose that's what results from a no-compromise design for the RV. NEW DEVELOPMENT - Jan/05 - The aviation division of Whirl Wind Propellers has been sold to the owner of Titan Aircraft, John Williams, who has formed a new company called Whirl Wind Aviation. My understanding is that he will be manufacturing and selling WW props from Titan's Ohio facility. I do not know anything about their credentials, intent for the future of the product line, or support policies.